Shaw’s Redemption by Asparagasm – A Truly Unique Vegan & Gluten Free Dining Experience! Recently I had the pleasure of attending one of the most pleasurable dining events I’ve ever been too. An evening filled with gourmet vegan food, wonderful company and outstanding entertainment. 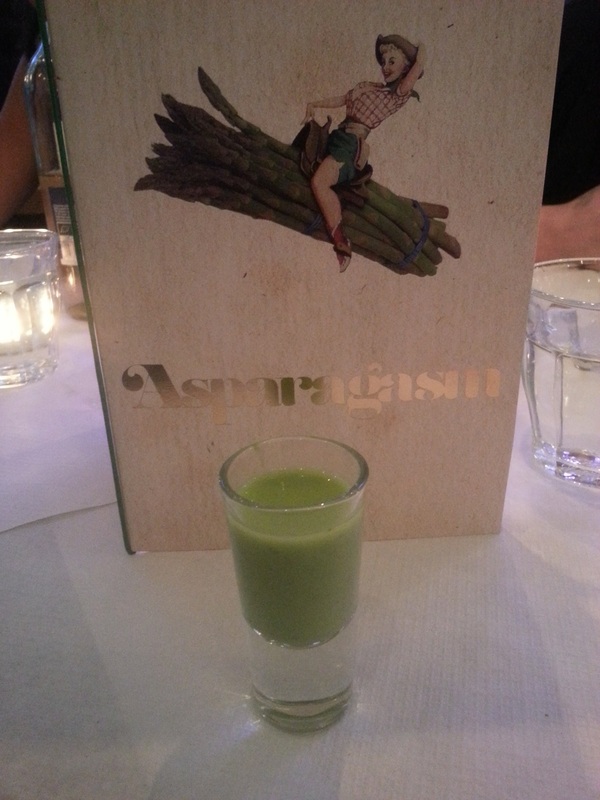 Asparagasm offer “pop-up” style vegan & gluten free dining events, that are different to anything you’ve experienced before. Working with talented chefs, exclusive venues, they combine a beautiful 5 course meal with highly creative themes and entertainment. Featuring seasonal and organic produce, Shaw’s Redemption was held in honour of Irish Nobel Prize winner, George Bernard Shaw. A well renowned playright and novelist, and a man with a strong vegetarian voice in the Victorian era. Our evening started with a wonderful non-alcoholic fruit punch – there were gorgeous looking cocktails for the libatious! The bar was a superb steam-punk installation with rotating parts and funky lava lamps, from Circus Kinetica. Absolutely stunning. The room itself was simple and elegant, and the tables beautifully set. The menu – complete with themed names – was enough to make anyone’s mouth water. And here they are, in all their flavour filled glory. The shots of pea & mint soup were so tasty and everyone around the table was hoping for sneaky seconds! The asparagus salad was almost too perfect looking to eat, yet I’m so glad I did. It was the most tender and beautifully cooked asparagus I’ve ever eaten. Gluten free and vegan pies are always a winner with me and this ‘Golden Globe’ of quinoa and beetroot was outstanding. So moist and rich, with crumbly pastry. Perfection. 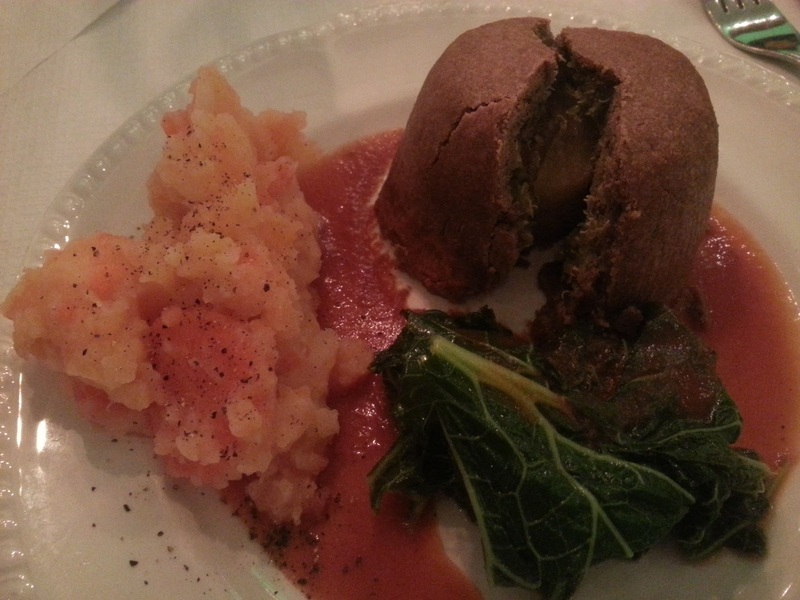 Mashed root vegetables on the side were a simple yet delightful accompaniment. 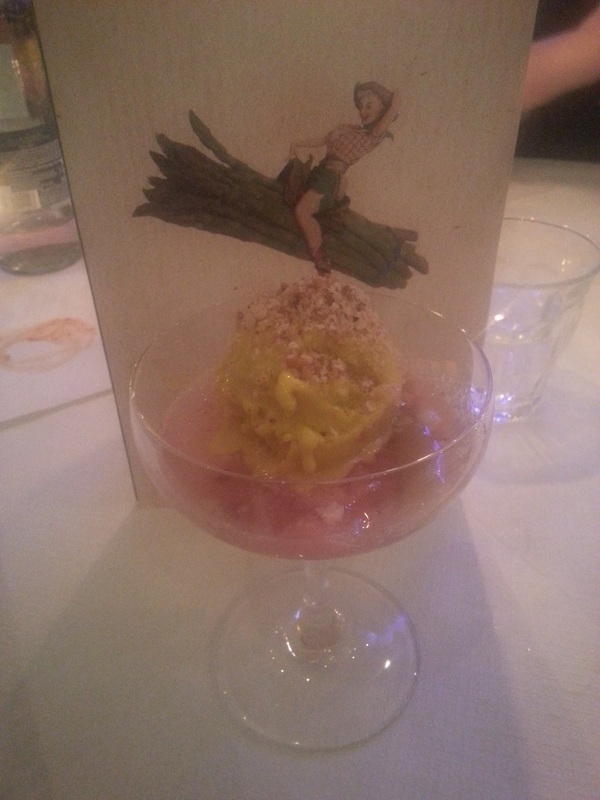 Of course, the arrival of dessert attracted many ‘oohs and aahs’ – a lovely balance of sweetened rhubarb crumble with tangy ginger ice-cream. 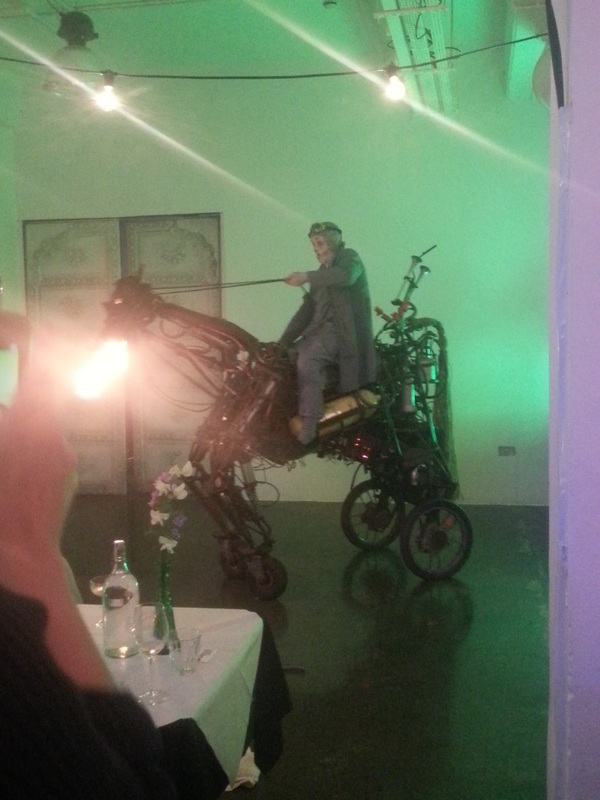 Whilst we settled our tummies in anticipation of the cheese board, we were entertained by the quirky Paka & Rusty – a fire breathing steam-punk horse and his companion. George Bernard Shaw’s poem ‘Living Graves’ was recited at the end of the performance. A reminder of Shaw’s vegetarian beliefs and of our own reasons for becoming vegan. 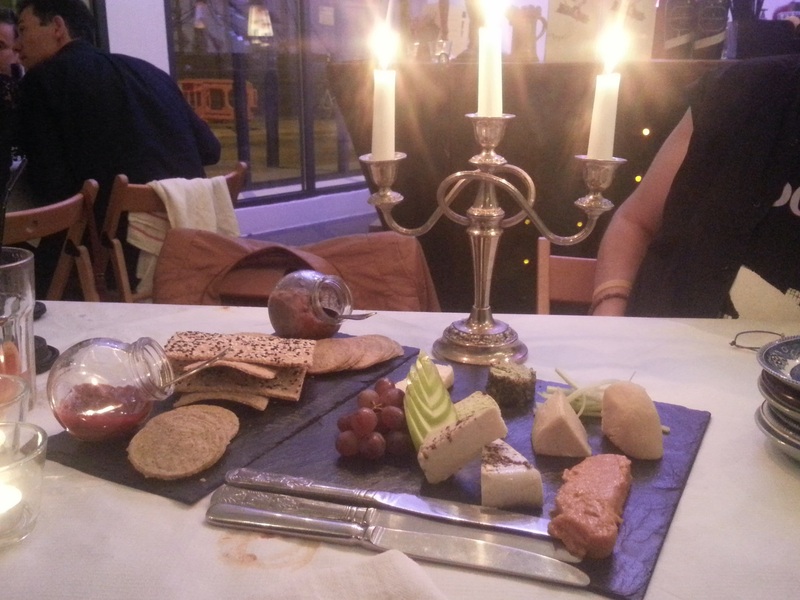 After the fire and excitement, we were ready for the favourite three words a vegan loves to hear – VEGAN CHEESE BOARD! And just look at it! Lots of nut and soya cheeses, with a variety of textures and flavours. Absolutely divine. Beautiful crackers and chutneys to accompany each and every flavour. We spent the remainder of the evening scoffing and chatting. It’s evenings like these that prove just how much we don’t need to use animal products to make an amazing meal. Any talented chef can put on an impressive course like this, with just a little imagination and the right ingredients! We had an absolutely amazing night and made some lovely new friends. Thanks to Asparagasm and all who made it possible! 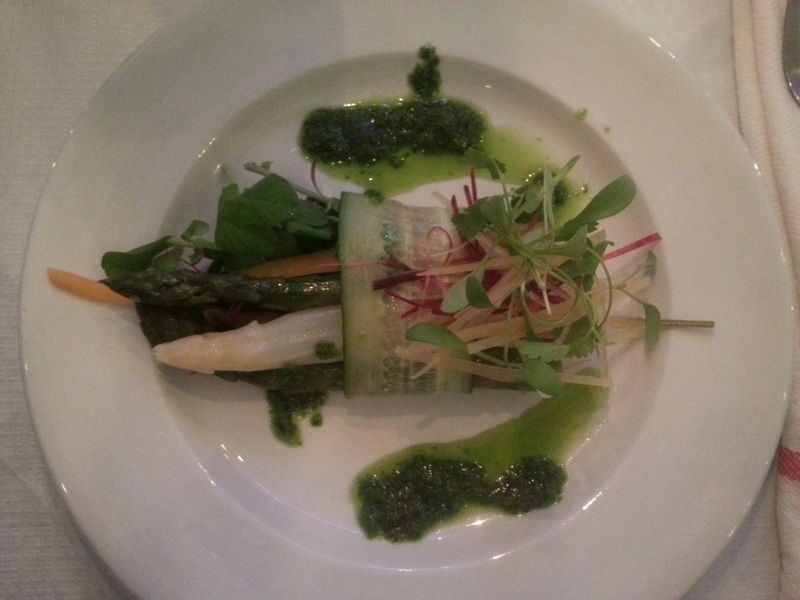 Do keep an eye out on the Asparagasm page for future events – you don’t want to miss them!